Know what's even better than having a ribbon on your quilt? 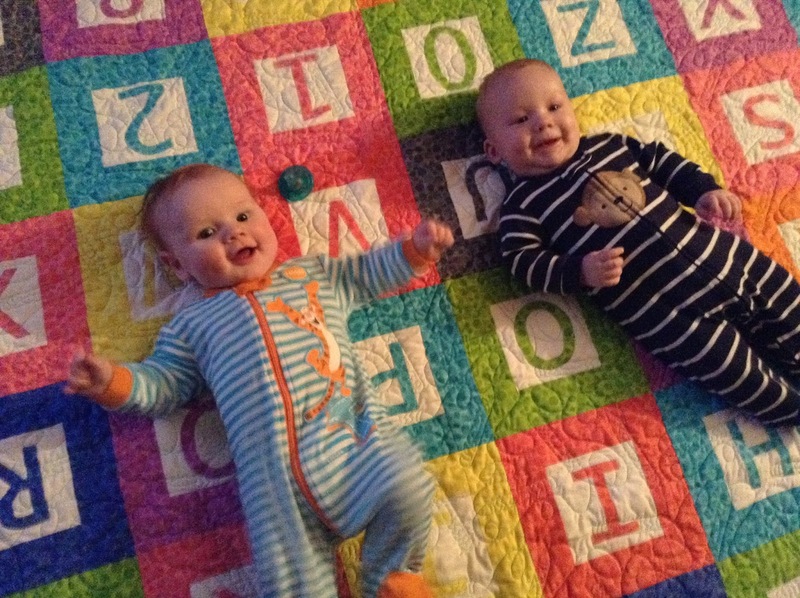 Having two grand babies on your quilt! Jeanne Kaye Speight of Fredericton sent along this adorable picture of 4 month old cousins, Nate and Ryan, and it was too cute not to share. 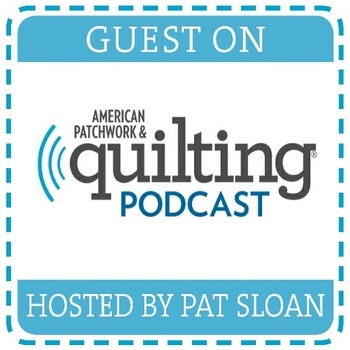 This is what quilting is all about. You can find the pattern for the Quilt of Learning here...but you've got to supply your own beautiful babies. Beth Munroe, who owns Mrs Pugsley's Emporium, dropped by last week to show me a Christmas stocking she had designed using the "roll up" pillowcase method. It was a "why didn't I think of that?!" moment. I think it's brilliant!! 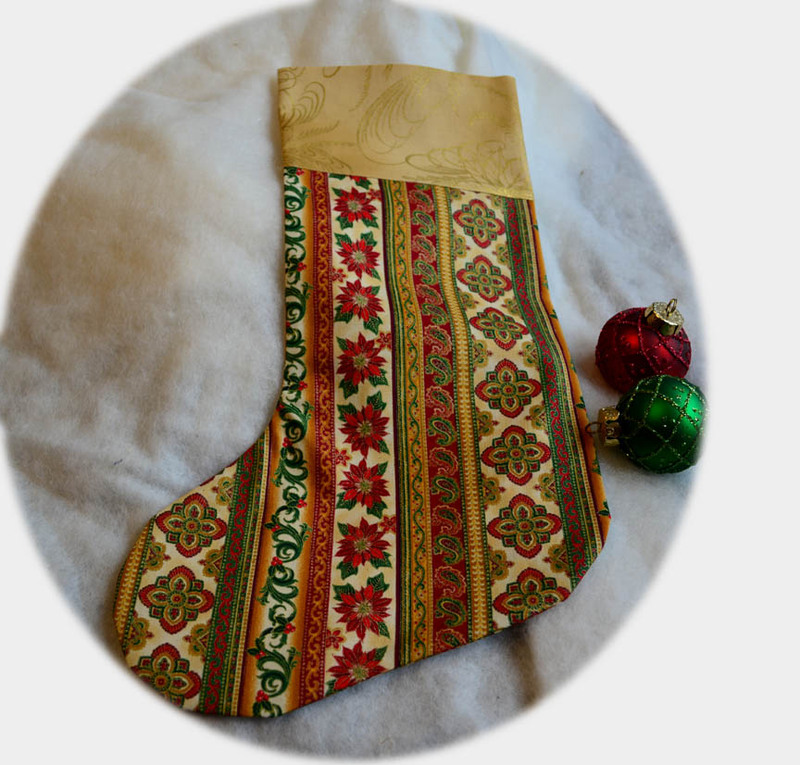 She posted the directions on her blog and using her sock template, I tried it out. It's so simple. Three seams and you're done. Mrs P's sock has two colours in the cuff, but I just used one. I hope to make several and use them as gift bags, trying a ribbon on the seamline where the cuff meets the sock. Less than 15 minutes start to finish, and all seams are enclosed in a French seam. 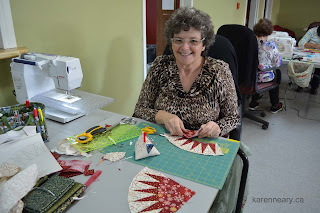 Beth is happy to share the instructions on her blog. Sometime an email can make you feel so good inside. Such is the case with this one, from Marilyn Eparvier, who wrote asking permission to enter her version of "Florentine" in national exhibits. (Click that link to see my original). Her quilt is beautifully done; I am thrilled for her to show it off. 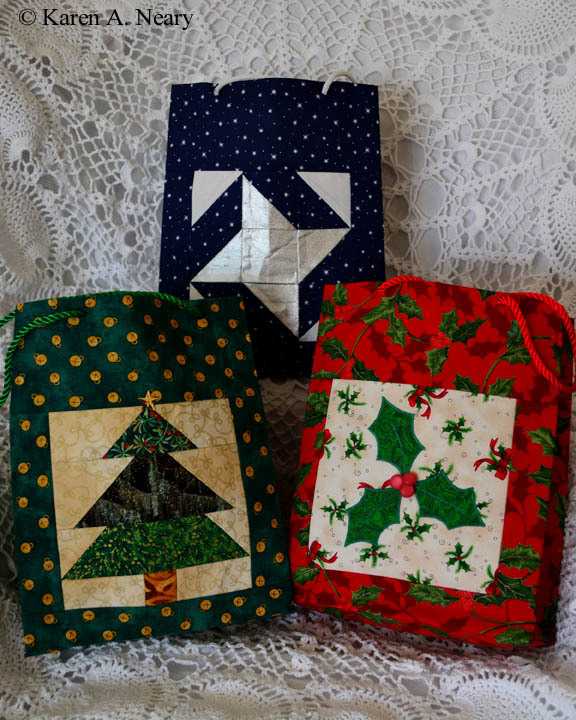 Marilyn writes, "I was so impressed with everything about your quilt that I even made similar fabric choices, something I never normally do. 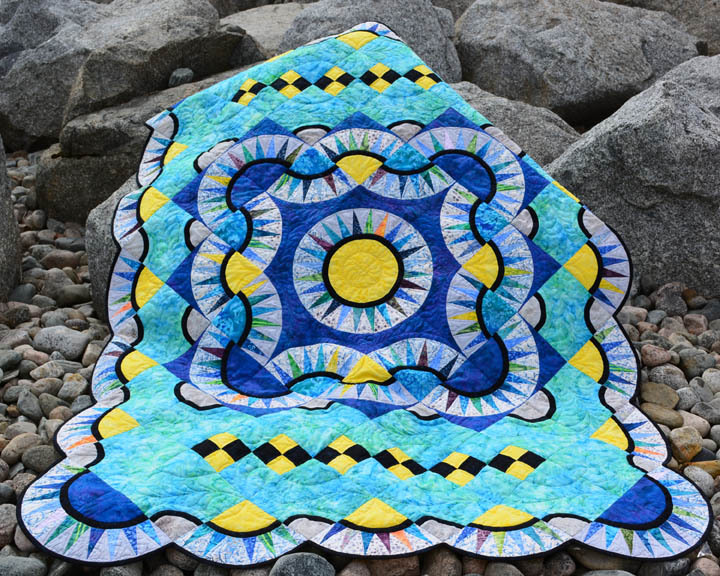 Your book "Quilting Beauties" from AQS is excellent, chock full of inspiration and helpful information...When the quilt was on my design wall waiting to be bound, my daughter took one look at it & said, "That's the one I want! That one is perfect." 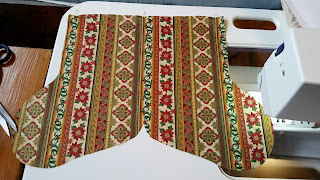 Everyone who has seen it is so impressed with the innovative way the traditional New York Beauty pattern is incorporated into the total design with such beautiful results...This quilt was so enjoyable to make; even the quilting with gold metallic thread went very well and was fun. I am looking forward to your next book." 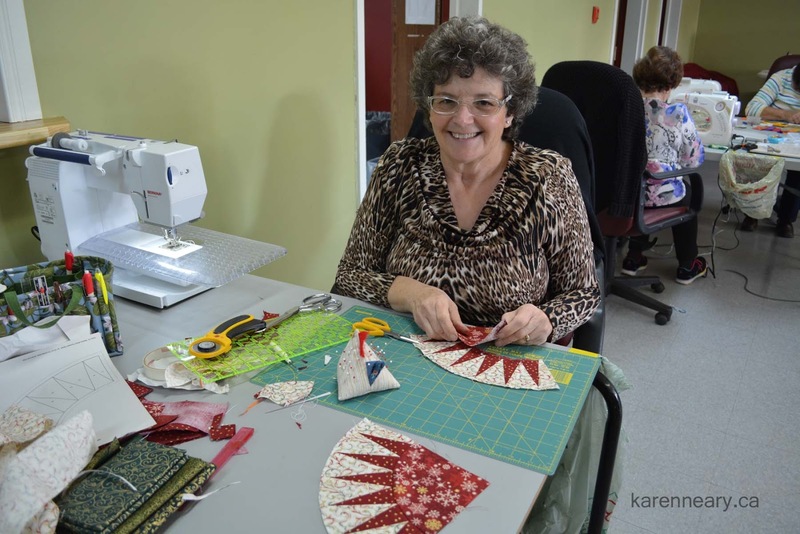 You can see Marilyn's exquisite quilting below. 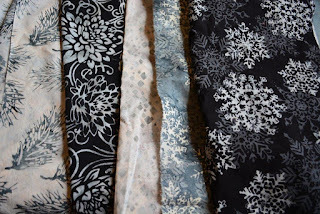 The fabric by the way, is a gorgeous collection from Hoffman Fabrics. 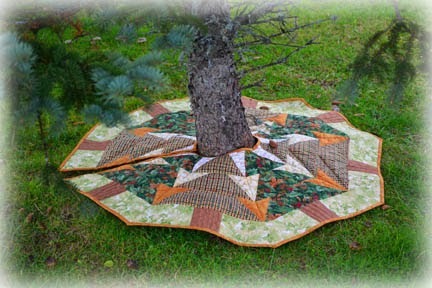 Thank you, Marilyn, for your very kind words, and for doing such a stellar job on your quilt. I look forward to seeing some big ribbons on your beauty in the upcoming year! 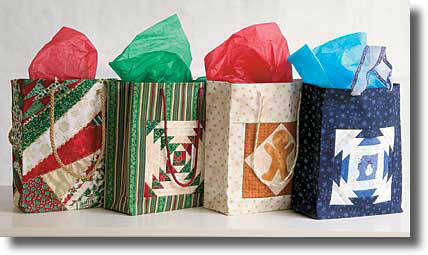 For many, the holiday shopping has not only started, it's finished and folks are starting to wrap. I know this, as my gift bag patterns have been flying off the shelf! 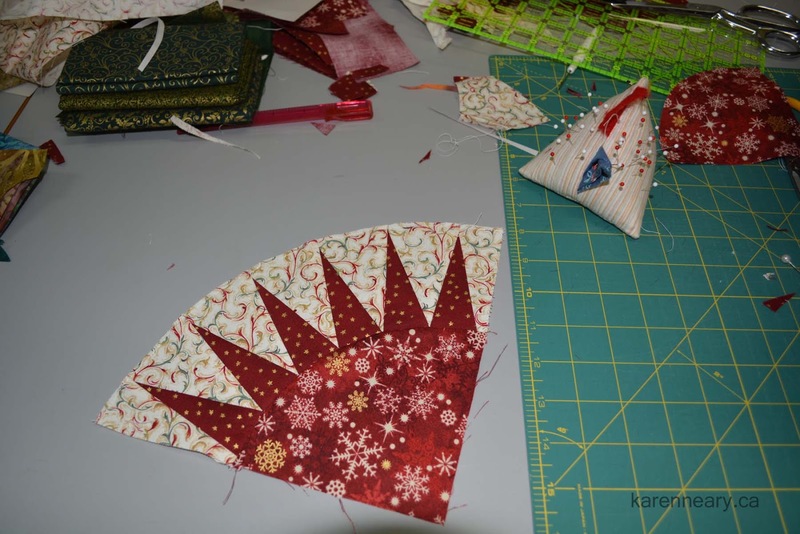 It's the ultimate packaging for a guild gift exchange, or for a special quilting friend, and a good way to use up some of your scraps. You can even get creative and substitute orphan blocks left from previous projects. 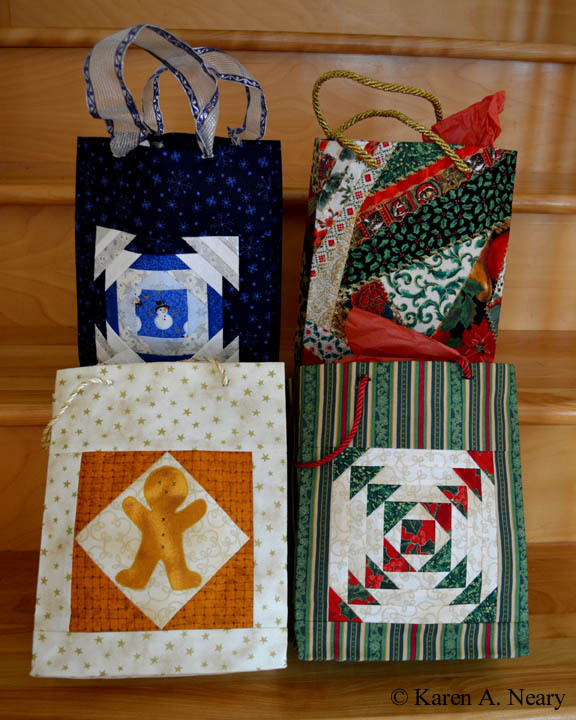 The bags are simple to construct, very sturdy, and reusable year after year. The first gift bag pattern was so popular, I added another with four versions: a crazy quilt, two using patchwork (foundation piecing) and a pieced and appliqued gingerbread man. The bags are medium sized, measuring 8" x 10". 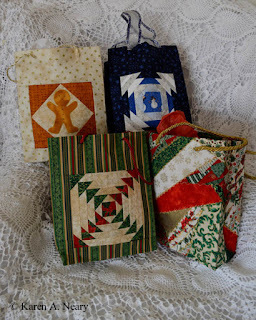 If you would prefer printed copies of the pattern, you can find them locally at Mrs. Pugsley's Emporium, or mail-order them from my website. (scroll down the list, they are near the bottom.) 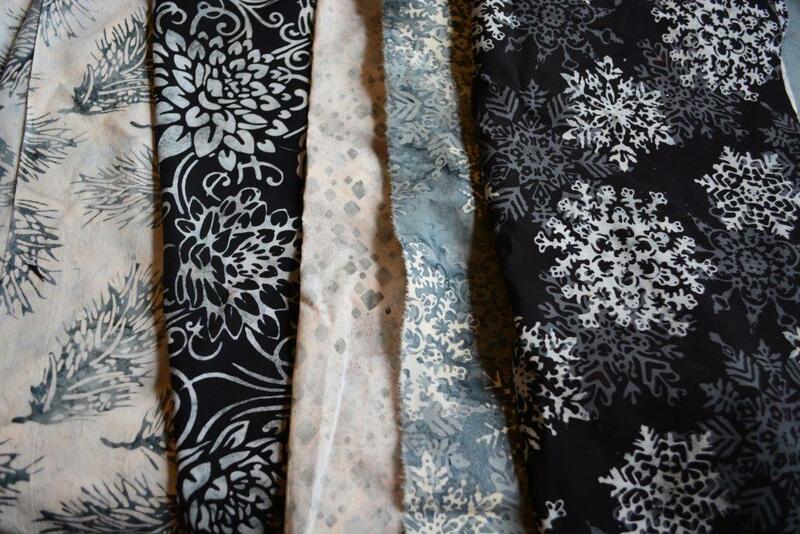 For those ordering patterns as gifts, I am happy to wrap and mail directly to your recipient at no extra charge. Wrap it up early! 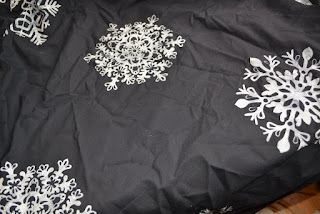 I used beautiful Hoffman batiks, printed with snowflakes, in black and greys. 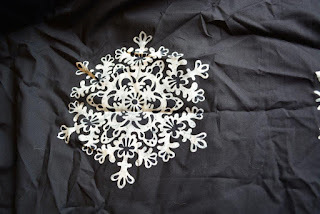 The large snowflakes were fussy cut for the centre, and for the semi-circles on each end. 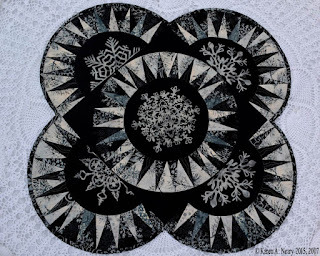 There was enough solid black around the snowflakes that I could cut plain background pieces to square out the centre sections. 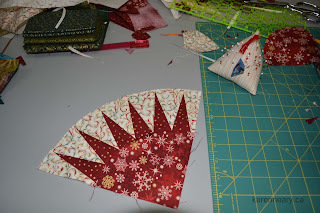 I chose a medium grey Aurifil thread (#2610) for piecing. 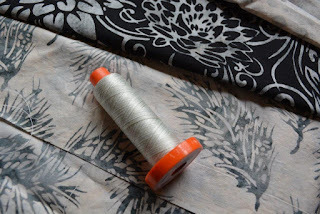 When it came time to quilt, Aurifil #4060, which is a very subtle white to medium-dark grey variegated, was a perfect choice to blend with the batiks. 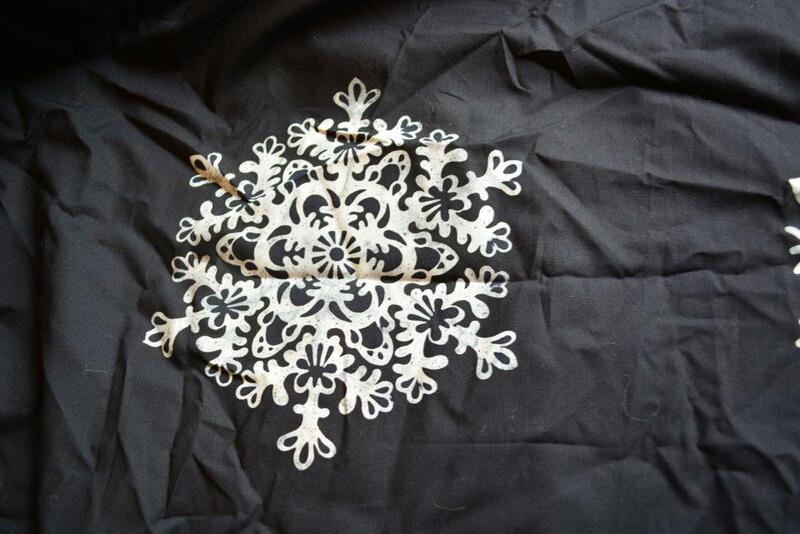 My quilting was free-form ice shards. 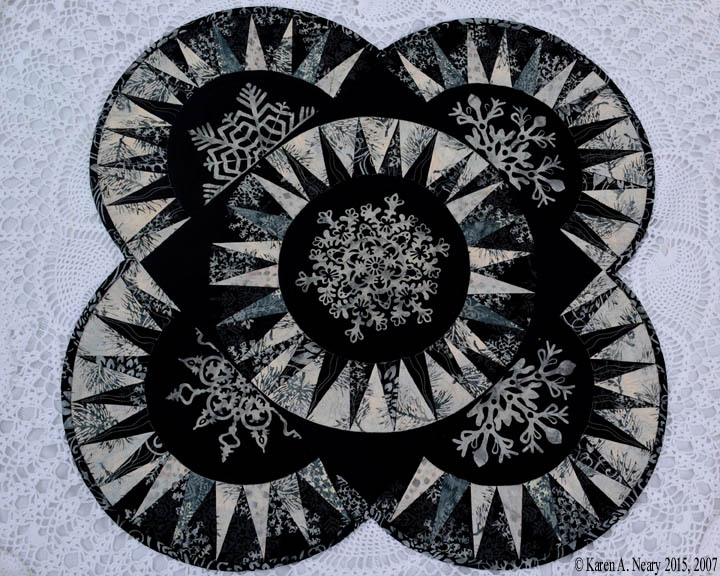 The spikes of the New York Beauty block make a perfect halo around the batik snowflakes. I am really, really pleased with how this turned out. 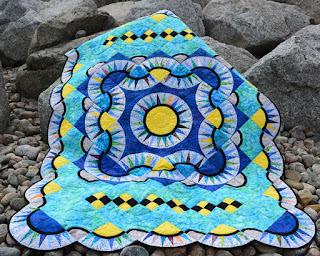 The pattern for original Maritime Beauty may be downloaded here. More loveliness to share! This is Judy Vargas' interpretation of Ostentation. 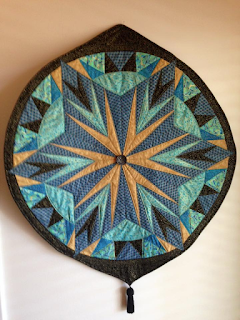 Judy has added a very pretty colour pattern around the outer ring - I especially like the gold tips at the top of each of the star points. 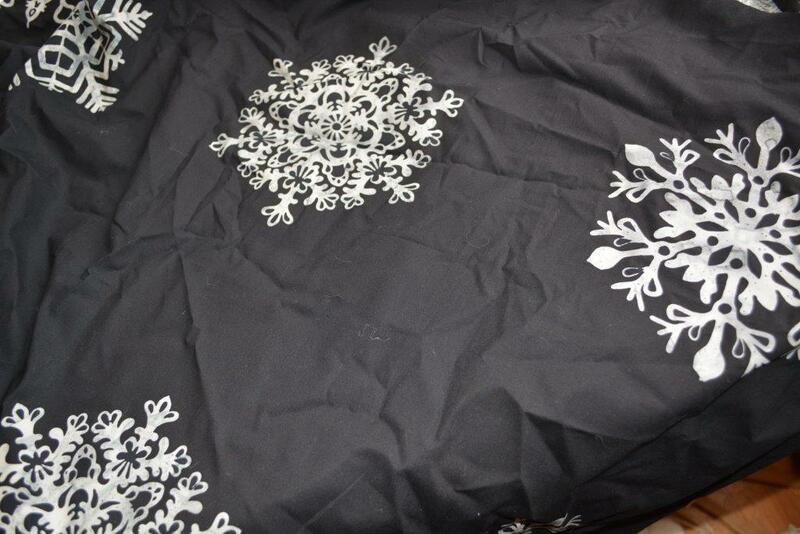 Judy writes, "As you can see I modified the pattern...and am pleased with the outcome. It's going to be donated to Hospital Sisters Mission Outreach so they can auction it off." What a generous way to share your talents, Judy; congrats on this beautiful piece of work. 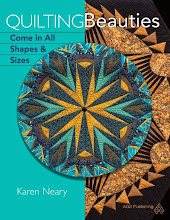 Ostentation appears on the cover of Quilting Beauties. In a day of trick-or-treating, I received this lovely photo which is absolutely the latter. 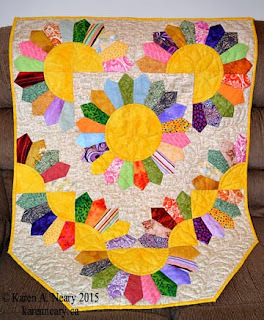 Louise writes, "I am really pleased with how it turned out. 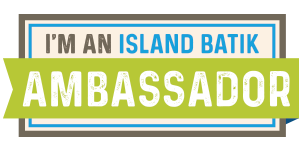 Your directions were great; I enjoyed the class very much and meeting you." I enjoyed meeting you and your guild too, Louise, and can't wait to see more pictures from the day.